This is my first time writing on The Journal about the lovely folks who support this space and I can't think of a better week to do so. Here in the states we're getting ready to celebrate Thanksgiving, which has me thinking about all of the things I'm grateful for this year. I must say, the community support I find both online and offline is rocking my world in 2013. Just one example: blog sponsors. Becoming a sponsor of a blog is much more than just slapping up a banner or sidebar ad and calling it a day. As someone who is on both sides of blog sponsorship (I also sponsor a few of my favorite blogs from time to time), I can tell you that it's more about building relationships than anything else. While I've only got one current sponsor to share with you today, I'm pretty stoked tell you about them. They've stuck with me through my transition to this new online space, their content offers me a chance to get out of my own head and just enjoy their fun-loving ways and I'm fairly certain that if we lived a little closer, we'd hang out regularly. Marissa and Sam are the creative duo behind the blog Bourbon and Goose. They offer up adventurous and fun-loving content, complete with playlists, creative ideas, the scoop on where the cool kids hang and much more. They're super involved in their community offline, which is always incredibly inspiring. 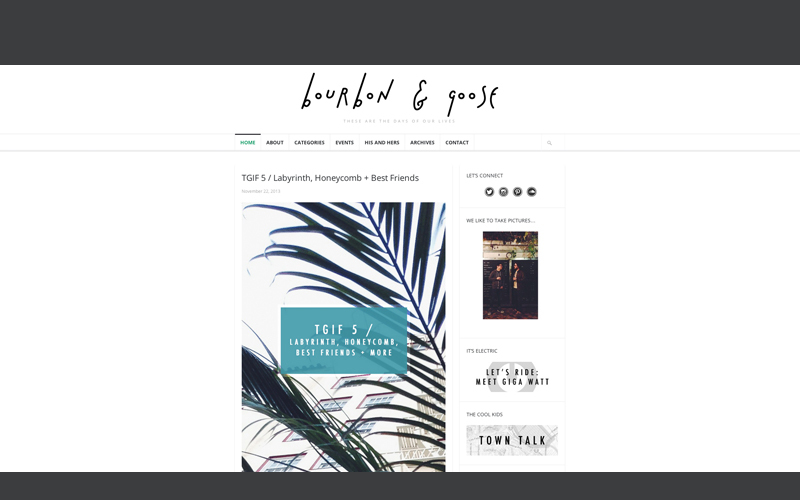 If you're into various types of creative goodness, I highly recommend checking out Bourbon & Goose. All of the sponsors who have supported this space – both past and present – have played a huge roll in building this online community and I can't thank them enough. If you have a chance, please stop by and say hello to the folks behind Bourbon & Goose. They're the real deal, my friends! Interested in partnering with me? You can learn more about sponsorship opportunities here.